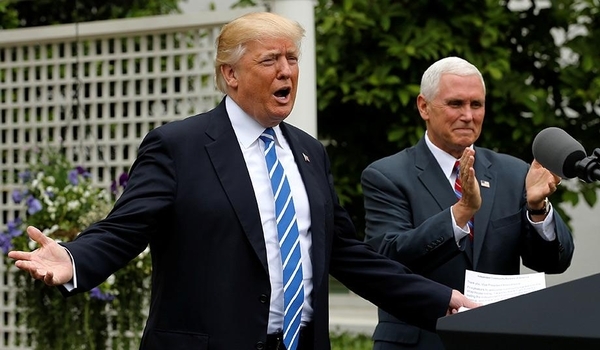 It is often hard to discern, but, despite an unprecedented amount of friction and the continued implacable hostility of the discredited post-Reagan political establishment, Donald Trump is continuing to gain ground in his holy crusade against them. He mousetrapped himself into turning 100 days into an important milestone, unlike any other president except Franklin D. Roosevelt (who had a unanimous mandate to deal radically with the Great Depression). Very predictably, this has turned into an empty-net goal for the large swath of the media whom he has correctly described as, in terms of honest reportage, "enemies of the people." But in fact, although the impression has often, and not always inaccurately, been one of chaos and unserious amateurism in the administration, the president has achieved a lot. He has dodged a trap by ignoring the silly partisan overreach of carefully chosen left-wing courts on the West Coast over his immigration executive order, and will surely be vindicated by the Supreme Court, a seat on which he has successfully filled. Illegal immigration has already declined by 70 percent. The foolishness about Trump's campaign collusion with Russia will soon be hanging around the neck of the Democrats like a toilet seat. He has dismantled the eco-hysteria apparatus that responded to unproved climate alarmism, and he has moved to reduce foreign oil imports. And American foreign policy is inching toward coherence: Substantial discussions appear to be underway with Russia and China, and North Korea is being faced seriously for the first time since the Clinton administration started down the garden path to impossible cooperation (and made the ex gratia payment to the Kimist hermit kingdom of $4 billion). But the coruscation of the Trump phenomenon: whether it is a defining and positive turn in American history of great importance, or an interlude in American decline of histrionic and comedic note only, depends on the revival of economic growth, and this depends on the proposed changes to the tax system and the health-care system. The Democrats are still circling the airport in disbelief that they and their Bush-Romney-McCain Republican doppelgängers are really more than temporarily out of control. They will not dream of coming back to ground and cooperating in anything with this administration until they are convinced that Trump is not just a dreadful but fleeting nightmare, a dark meteor over their incumbency in the public trough. The Democrats might have to vote for infrastructure renovation, and will be hard-pressed to try to oppose tax cuts for the modest and middle-income taxpayers. But they will cling to the pieties of fiscal responsibility as long as they can, perfectly oblivious to their party's magnification of the federal debt accumulated in 233 years of American independence by 125 percent in the Obama years. No sane participant in the American political process can dispute that economic growth is desirable, and that it can absorb and defray a large chunk of increased spending. GDP growth declined from 4.5 percent annually in the last six Reagan years, to 3.9 percent in the last six Clinton years (as the current-account deficit and the housing bubble ballooned), to 2 percent in the George W. Bush years, to 1 percent in the Obama years. If per capita GDP had increased in the first 15 years of this new century as it had in the years between 1945 and 2000, families and individuals in the United States would be 20 percent wealthier than they are. In the Reagan years, the federal debt increased from 40 to 50 percent of GDP. That debt declined a little in the Clinton years, but, in this century, even as a percentage of GDP, it has more than doubled. These are extremely dangerous trends. The average American is aware of a 15-year flatlined income in terms of buying power, and the absence of job security despite an official level of unemployment of a very acceptable 4.7 percent. Most would know, from their own experiences or acquaintances, that the labor force has shrunk, in fact by 15 million people. There are now over 20 million Americans of prime employment age (25 to 54) who have dropped out and are sustained by the benefit system, especially Medicaid-supplied painkillers, food stamps, and activities that generally escape official compilation. Many of these are among the 750,000 people released each year by the bloated and corrupt prison system, which does all it can to demotivate, stigmatize, and render unemployable those released — and make more likely the return to its embrace. The system in any case always imprisons at least as many new convicts each year. If the Trump administration does not get a tax bill through that rekindles economic expansion, the entire American project is going to face its greatest crisis since Roosevelt came in to grapple with the Great Depression. Naturally, as part of the magic-carpet ride the media gave to the Obama administration, the extreme doldrums of the country's economy were not much mentioned and overmuch was made of the practically irrelevant official unemployment number. There was a fair amount of discussion about people living "from paycheck to paycheck" and some comment on the strained purchasing power of much of the middle- and working-class people. But it was all in the context of the slow recovery from the financial crisis of 2008, which was laid entirely at the door of George W. Bush, though the pieces of the disaster were put in place by President Clinton and his overrated collaborators, Robert Rubin and Alan Greenspan. When the music stopped, it was President Bush who reassuringly uplifted us with the comment that "the sucker could go down," referring to the national economy. President Obama was allegedly concerned during the 2012 election, which was pretty close after the first debate, which Governor Romney won, that Romney could win the election and get the credit for "the recovery." If the numbers are computed properly, there has been little recovery. President Trump has proposed tax changes — simplification, rate reductions, elimination of special exemptions, patriation of overseas corporate profits — that will induce a recovery and reverse 30 years of declining economic growth. Nothing less than the specter of the end of American confidence in ever-brightening prospects, and the thought of a nation in durable decline — something the great nations of Europe and Asia have faced but the United States has not, a repulsive and horrifying assault on the whole American ethos and mythos — impends if Trump does not get a serious tax and health-care reform through. He has courted the Congress, even many of the Democrats, very assiduously lately, and no one in Washington can fail to see the need for comprehensive action. In most matters, the whole system has been gridlocked since Bob Dole and Newt Gingrich put through welfare reform in 1996, and President Clinton, with some reluctance, signed it. This is a make-or-break moment, not just for the administration and the long-dysfunctional system, but for the American people and nation. Everyone will have to look beyond the foibles of the president and the shambles of partisan discourse and unseemly maneuver. It must happen in the next year.